1 All product links are affiliate links. Many thanks for helping me keep the lights on around here! All product links are affiliate links. Many thanks for helping me keep the lights on around here! 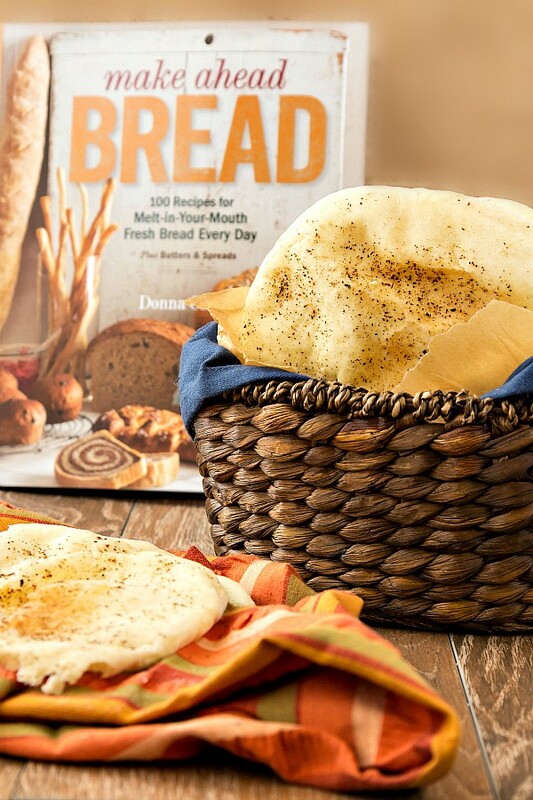 Tomorrow is the first anniversary of the publishing date of Make Ahead Bread: 100 Recipes for Melt-in-Your-Mouth Fresh Bread Every Day by my friend Donna Currie of the blog Cookistry! Huzzah! In honor of the day, I made the whole wheat pita bread from her lovely book. And then we ate a lot of it with hummus. 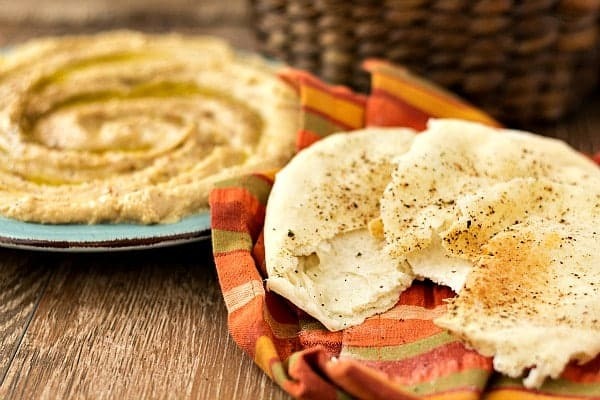 Because hummus and pita go together like Forrest and Jenny. So, what’s Make Ahead Bread all about anyway? Does it mean you just have loaves of bread you made a day or two before lying around? No. No it does not. Make Ahead Bread is Donna’s way of breaking down what can be a somewhat intimidating process–making yeast bread–into a two (or three) day process. Make and knead the dough and give it a first rise on day one, shape it then wrap it up and toss it in the fridge for up to 24 hours or so and then bake the next day. The second rise happens in the cold, dark fridge, so not only is the dough ready to bake right when you pull it out, but it also develops more flavor from its rest. Nice, huh? And it was perfect. Perfectly easy to make and delicious. Seriously, on the first day, I just threw all the ingredients in my mixer and kneaded until the dough came together in a ball. That was it. No “knead for 12 minutes after dough comes together.” I just kneaded it, shaped it into a ball, threw it in an oiled freezer bag and shoved it in the fridge. The next day, I grabbed the dough (which had obviously risen), cut it into six portions, rolled them out and baked them. Because I’m me, I did brush each round with a bit of olive oil and topped them with a sprinkle of za’tar, because I can’t get enough of that. And I think Donna would approve. She even says that baking bread is like live theater, with a cat loose in the theater. I have the cat part down in spades, and I’m all about improvising, so to have permission to go crazy and bake breads the way jazz musicians play…well, jazz…is really liberating. That’s one of my favorite things about Make Ahead Bread. I chat with Donna online pretty frequently, so I know what she “sounds” like, and her book sounds just like her. Casual, funny and confident. And helpful. In reading this book, I could hear Donna. She says to relax and have fun with baking. Her instructions are clear and easy to follow. 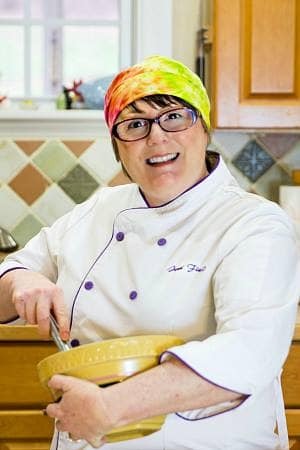 Her recipes are solid and the results are just wonderful. The idea of incorporating long, slow rises breaks up the formidable task of baking bread in a day, and the result is bread that is always more flavorful than what you’d get if you did bake it in just one day. If you’re intimidated by baking with yeast, celebrate the first anniversary of Make Ahead Bread and let Donna hold your hand and teach you to make all manner of delicious Items. And if you have leftovers? No problem. Smart Donna includes a chapter on how to use up some of that leftover bread so you don’t end up overfeeding the local bird population. Wonderful! Other interesting points to note: there are some gluten-free recipes included, so there really is something for (almost) everyone. Included is a wonderful chapter about spreads to put on your bread including many compound butters and some cream cheese spreads. So now, not only can we make bread, we can also make spreads to serve with/on the bread, and we get recipes for how to use up leftovers. So, let’s make pita! Recipe reprinted from Make Ahead Bread: 100 Recipes for Melt-in-Your-Mouth Fresh Bread Every Day by Donna Currie, The Taunton Press, 2014. 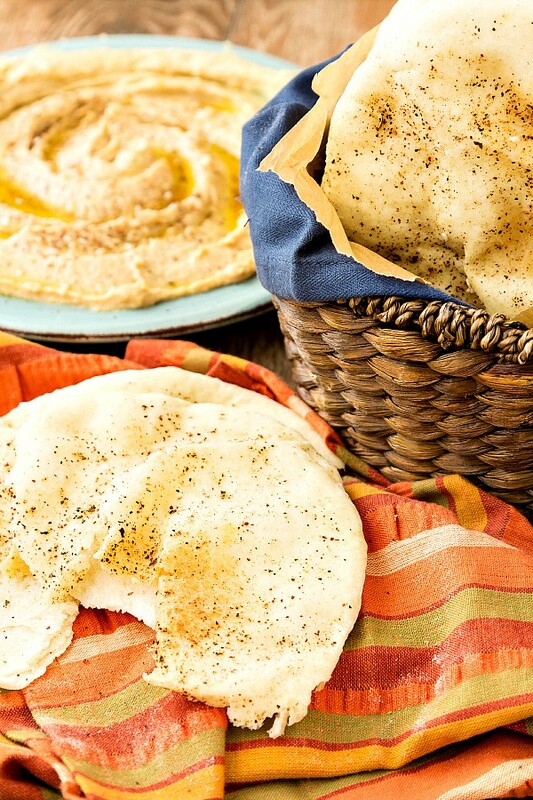 This whole wheat pita bread yields maximum flavor with minimal effort. If you've never made yeast bread before, consider making this whole wheat pita as your gateway bread! The rest following is all excerpted from Make Ahead Bread, p120: These whole wheat flatbreads are perfect for ripping, dipping or topping. I like them topped with greens dressed with balsamic vinegar and good olive oil and a crumble of feta cheese. These are best served the day they're made, but the good news is that you don't have to make them all on the same day. The dough is good for at least 2 days and up to 4. Combine all the ingredients in a stand mixer with a dough hook and knead until a ball forms. There's probably residual oil in the spoon you used to measure the oil. Drizzle that into a gallon-size zip-top plastic bag, or just add a teaspoon of oil to the bag. Place the dough in the bag, close the top, and refrigerate overnight or up to 4 days. Heat the oven to 375F and line several baking sheets with parchment paper. Flour your work surface lightly. 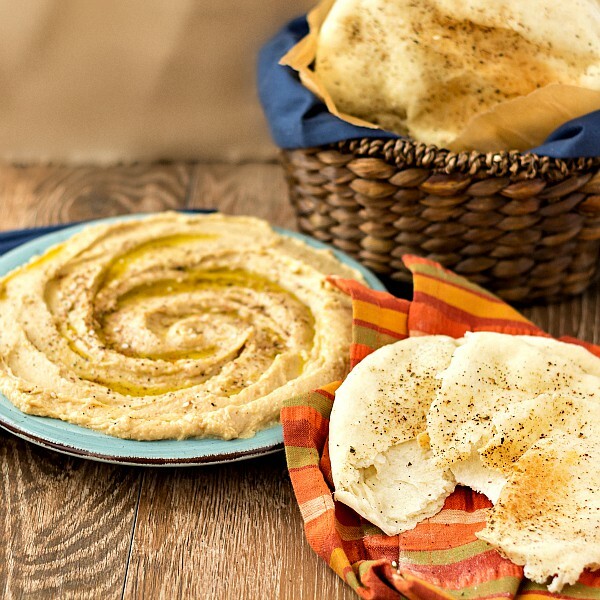 Turn out the dough and divide it into 6 pieces (for 6-inch diameter pitas) or 12 pieces (for 5-inch diameter pitas). Form the pieces into balls, flatten them into disks, then use a rolling pin to roll them to the desired size. Place some on a prepared baking sheet; you can place the disks close together, but make sure they aren't overlapping. (I was able to place 3 on a sheet). Continue rolling and baking the pitas until all the dough is used up. As the pitas get done, stack them on top of each other, and cover with a clean kitchen towel. Serve warm or at room temperature. And there you have it. 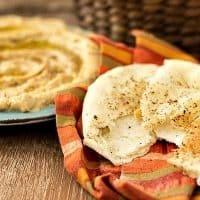 Excellent, easy to make pita bread (which of course you can coat with sesame seeds, za’atar like I did, poppy seeds or whatever your heart desires) which is soft and pillowy and wonderful to swipe through hummus, your favorite dip, or used as a sandwich wrap. Make Ahead Bread allows you to spread the making over two or even three days so bread baking fits into your life. Find a place to fit this book into your cookbook collection. It’s a gem. Head over to Laura Kumin’s site, Mother Would Know, to enter for chances to win a copy of Make Ahead Bread. The giveaway runs for two weeks, so you have until November 17 to enter! Thank you so much for taking the time to read today. Take care, and have a lovely day. 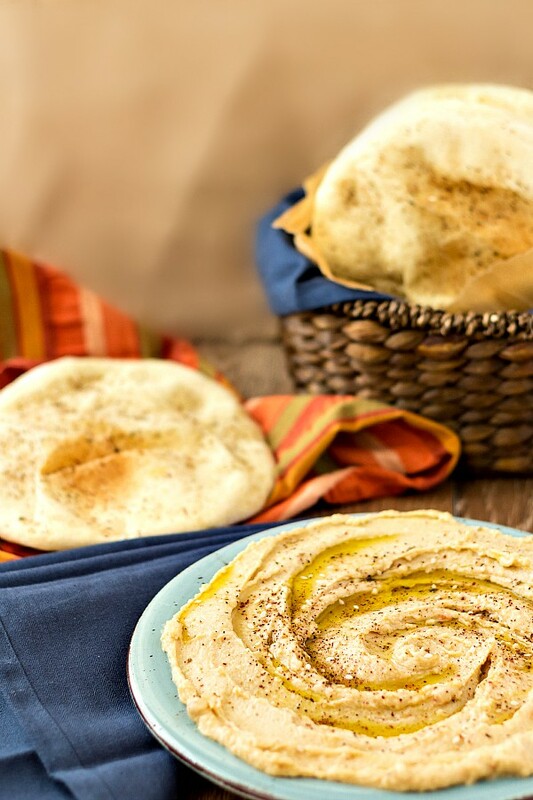 I’m delighted to see this recipe–my family loves warm bread dunked into ________ (honestly they are not choosy–olive oil and baguettes, naan and eggplant dip–we don’t care what the bread and what the dip) but I’ve never tried to make pita. I can only imagine it tastes amazing with a little sprinkle of za’tar–your photos look terrific! I think I’d fit right into your family, Kirsten! I am an inveterated Bread Dunker-Inner as well! And right now, I am putting za’atar on everything! What? No croissants? =) I’m definitely trying this pita next. Love Donna’s book! If I’d only planned ahead a *little bit* more, Karen! lol =) I can highly recommend the pita though!